Banes, Sally, “Imagination and Play: The Films of Ericka Beckman,” pp. 98-112. Bordwell, David, “Narration and Scenography in the Later Eisenstein,” pp. 62-80. Brender, Richard, “The Quiet One: Lyric Poetry of the FairDeal,” pp. 81-97. Bruno, Guiliana, “From Public Virtue to Private Vice: Notes on Italian Independent Cinema,” pp. 36-45. Carroll, Noel, “Art, Film, and Ideology,” pp. 120-32. Casebier, Allan, “Ideology and the Image,” pp. 116-19. Copjec, Joan, “Crystal Gazing: Seeing Red,” pp. 31-35. Gidal, Peter, “British Avant-Garde Film,” pp. 12-18. Le Grice, Malcolm, “Some Introductory Thoughts on Gidal’s Films and Theories,”pp. 19-30. 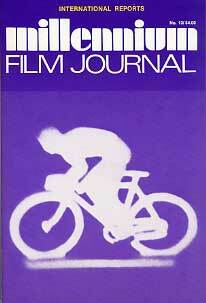 Rheuban, Joyce, “Secret Life: New Films by Hamburg Filmmakers,” pp. 46-61. Simon, Larry, “Music and Film: An Interview with Philip Glass,” pp. 133-39. Sondheim, Alan, “Theses on the Inversion of the Cinema,” pp. 7-11. Taubin, Amy, “The Whitney Biennial: Video,” pp. 113-15.